Kate at J. Stockard might be upset if she knew I occasionally wake up at night obsessed with formulating the content of my next blog post. 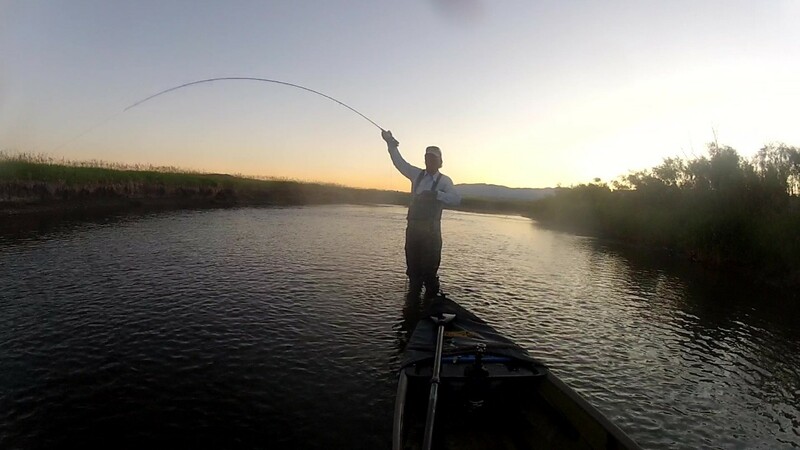 Getting back to sleep, especially in the early morning hours, is often difficult as I visualize my experiences on the rivers of Montana and at my fly tying desk trying to put together a theme for a blog post worthy of the J. Stockard website. Such was the case a few mornings back when the word “Crepuscular” seeped into my consciousness. I concluded, through much rehearsal in my head, that I was indeed by nature a Crepuscular Angler. In zoology, there are a series of terms, not all that unfamiliar, that describe the preferred (or maybe instinctive) period of the day any individual species is most active. Diurnal describes animals most active during daylight hours. Noctural describes animals most active during hours of darkness. There are two other terms in this group: Crepuscular and Cathemeral. Cathemerality is behavior in which a species has sporadic and random intervals of activity during the day or night in which food is acquired, socializing with other organisms occurs, and any other activities necessary for livelihood are performed. Of course we humans and many other primates are Cathemeral. Crepuscular on the other hand derives from the Latin crepusculum which means twilight. Even within Crepuscular species, there are two subgroups: matutinal (morning) and vespertine (evening). I have concluded that I am a Matutinal Crepuscular Angler. 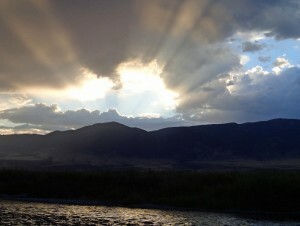 As a Matutinal Crepuscular Angler my goal is to be on the river fishing at first light, well before official sunrise. If my calculations are correct and travel unimpeded by unforeseen circumstances, my fly is usually hitting the water upwards of 45 minutes before the sun comes up. As my most favored rivers are destinations 50 to 100 miles away, this necessitates preparation the evening before, early to bed and early wake-ups. As early as 3AM in the long days of June and July. I have always been a fan of John Wayne’s famous phrase in the 1972 film The Cowboys: “Slap some bacon on a biscuit and let’s go! We’re burnin’ daylight!”. Whether that phrase was inspired by Jack London’s 1910 novel set in the Klondike “Burning Daylight”, I don’t know. As an apex predator of wily salmonids and other Osteichthyes (bony fishes), I have a lot of competition from other humans, most of which, at least in my territory are not by nature Crepuscular. The most popular rivers and sections thereof can get crowded during prime time hatches, but rarely before midday as most anglers and outfitters are diurnal by nature. I am always challenged when inviting others to join me on the river, even when they concede they are “a morning person”. The 3-4AM wakeup is usually met with “I thought you meant something like 8AM”. When there is human competition on the rivers, the probability of success on the day for any one individual goes down. Being Crepuscular, allows me to tackle prime stretches of river before the competition. Additionally, my prey, trout, particularly brown trout are too in a sense Crepuscular, favoring low light conditions and shadowy hides. 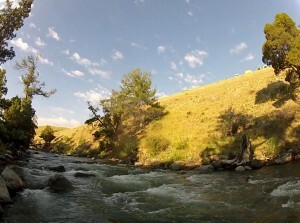 A recent foray to my favorite section on the Gardner River in YNP is illustrative of my matutinal crepuscular instincts. I’ve talked about this section of river before in Fishing Alone-An Oxymoron, Daytrip – Gardner River and Fishing on the Edge of Terra Incognita. It was July 1st, just 10 days after the summer solstice. Sunrise was about 5:35AM which meant there would be sufficient light to start fishing at 5AM. After the 85-mile drive, I was wadered up quickly with gear in hand for the 15-minute walk to the mouth of the river. On this day I made it to the mouth of the river by 5:15AM. On the north entrance road just above the river the entrance station was empty and barely 2-3 vehicles every 5 minutes or so were entering the park. Down on the river, the flow was crystal clear, and low for early July. By Gardner standards, it was a warm morning, mid 50s. On the bench during the walk in, it was evident that there were lots of young hoppers about. I had brought the 4 weight with a floating line in anticipation of fishing stonefly adults, stimulators and hoppers for most of the morning. On most counts, I was not disappointed. The last mile and a quarter of the Gardner winds its way to the Yellowstone river down a steep-sided and rocky canyon that for the most part runs in a north-south orientation. Such an orientation keeps the eastern bank (the remote side) and most of the river itself in shade until 10-11AM. On cloudy days this doesn’t much matter, but on sunny ones as was July 1st, bright sun is your nemesis in this crystal clear stream. In the low light of dawn, early morning shadows and turbulent water, keeping a visual on even a number 8-10 dry fly can be a challenge. The most successful flies on the morning were high floating Stimulators with generous wings of white Elk hair and the brightly colored Easy as Cherry Pie hoppers. As the river is lined with Junipers, Ribes and other assorted fly catchers, long casting is not necessary (nor possible) and an accurate roll cast is usually the ticket to success. In the lower summer flows, most of the eastern bank can be negotiated streamside as long as you are willing to clamber over a few larger boulders or downed Juniper snags. The matutinal crepuscular angler knows that good fish will be holding along deeper shore-side seams on the shady bank and floats their flies there. Mid-stream, fish are most likely holding just behind the larger boulders or in the last third of the fast deep pools. It is there that the flow is less turbulent and fish can hold deep in the crevices of the rugged bottom. If you can get a drag free drift on your large stimulator or hopper through these sections, it is highly likely you will see a nice brown or rainbow rocket up from the bottom in the clear water and attack the fly as it moves past. These attacks become far more cautious as the sun rises and begins to illuminate the mid-stream runs. It takes about five hours to fish this mile and a quarter stretch of the Gardner. As I near the Rescue Creek bridge, there is a short section with excellent holding water along the eastern bank and mid-stream. The bank lies are still in the morning shade while mid-stream is bathed in sunlight. Fish still aggressively attack my flies drifted along the bank but cautiously refuse those out in full sun. It is disappointing to see a nice brown or rainbow meander up from the bottom and slowly inspect and refuse that hopper floating by in the sunlight. Once this begins to happen with regularity, the day for the matutinal crepuscular angler is over. With the possible exception of the cold winter months, the matutinal crepuscular angler raises their probability of successful angling days by being on the water at morning twilight. Solitude on the river away from the more diurnal competition and hunting trout in their more natural dark and shadowy homes in twilight and early morning hours will put more fish on the hook. There is probably much to commend for the angler with vespertine crepuscular instincts, fishing evening hatches and the shadows as the sun recedes, but by that time I am safely home on the couch imbibing my favorite beverage. This entry was posted in Fly Fishing Life, Mike Cline, Bozeman MT, Our Regular Contributors and tagged early morning fly fishing, fly fishing, fly fishing advice, fly fishing at dawn, fly fishing life, fly fishing tips, Matutinal Crepuscular Angler on July 22, 2016 by Mike Cline. 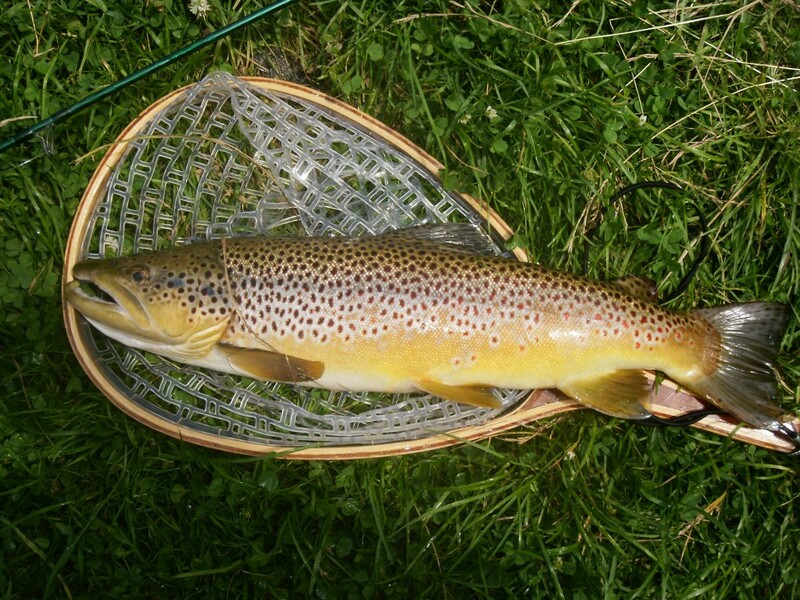 This entry was posted in Fly Fishing Gear, Fly Fishing Life, Fly Tying Tips & Tools, Our Regular Contributors, Phil Rispin, Fly Fisher & Photographer, The Art of Fly Tying and tagged burnt wing adams, fly fishing advice, fly fishing bugs, fly fishing life, fly tying, fly tying advice, mayfly on July 21, 2016 by Phil Rispin. This entry was posted in Fly Fishing Gear, Fly Fishing Life, Joe Dellaria, Learning From The River, Our Regular Contributors and tagged fly fishing, fly fishing advice, fly fishing gear, fly fishing life, fly fishing tips, nymphing, trout fishing on July 20, 2016 by Joe Dellaria.